I know that when an upward trend slows/stops growing we call it a plateau, but I can't separate that from the imagery of a geological plateau. 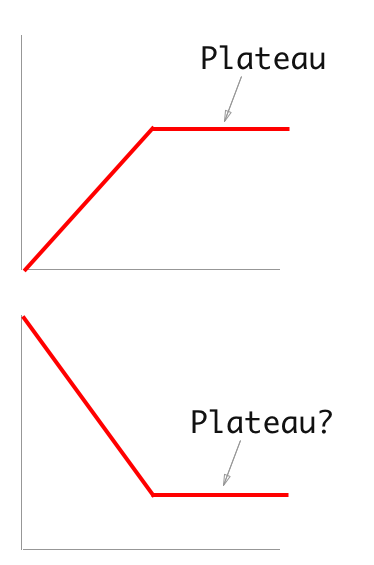 Does plateau apply to the second scenario with negative growth below? I would say so...plateau does, however, seems to imply relatively high flat territory. One might call this a 'bottom' or 'floor'. Not the answer you're looking for? Browse other questions tagged data-visualization terminology or ask your own question. What is the proper name of a model that takes as input the output of another model? Is an auto-correlation plot suitable for determining at what point time series data has become random, and how does one interpret the plot? What is this bar graph with subgroups called?